A coordinated clinic is the best place to go for Marfan syndrome and related disorders care. A coordinated clinic provides expertise in all Marfan-related specialties: genetics, cardiology (heart), ophthalmology (eyes), and orthopedics (bones and joints). 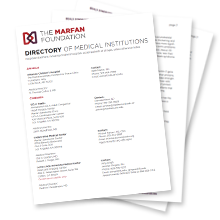 Download our clinic directory, which is comprised of institutions around the country that treat Marfan syndrome and related conditions.